Gibbs, Eddie and Ryan K. Bolger. 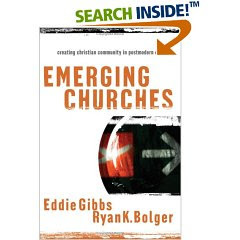 Emerging Churches: creating Christian community in postmodern cultures. Grand Rapids, Michigan: Baker Academic, 2005. 1. Shift from modernity to post-modernity. 2. Shift from westernization to globalization. 3. Communication revoloution featuring a shift from print media to electronic media/cyber communication. 4. Economic revolution with a shift from industrialization to an information based economy. 5. Breakthroughs in health and biology creating a myriad of ethical dilemmas. 6. The convergence of science and religion. With the onset of Generation X & Y’s “emancipation of self” they are coming of age and realize that the like Jesus, “Jesus is not the problem. It is the church they dislike, because they do not readily see the church living out his [Jesus] teachings.” They go on to observe that, “In postmodern cultures of the twenty-first century, a linear or text-based ecclesiology perpetuates secularity in the church and denies the church’s call to live incarnationally.” The ecclesial shifts that will facilitate the church living incarnationally include a shift from systematic to non-linear methodology, from elitist cultural disconnect to engagement with visual culture, an embracing of both transcendence and immanence of God, and an intentional incarnational engagement with the wider culture. Lastly, the creation of Christian community in postmodern cultures requires six practices (each with a featured chapter): welcoming the stranger, serving with generosity, participating as producers, creating as created beings, leading as a body and taking part in spiritual activities.